After a long and distinguished international career as a politician, commentator, and author, Conor Cruise O’Brien has written another tour de force that will surely spark debate. In First in Peace, O’Brien, described as a man who so persistently asks the right questions (THE ECONOMIST), both poses and answers the question of how America’s future was shaped during George Washington’s presidency. 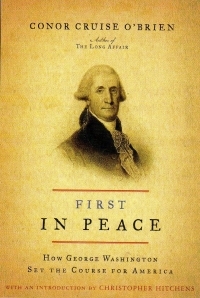 First in Peace considers the dissension between Washington and Thomas Jefferson, revealing Washington’s clear-sighted political wisdom while exposing Jefferson’s dangerous ideology. O’Brien makes the case that Washington, not Jefferson, was the true democrat, and commends Washington’s clarity of vision in restoring good relations with Britain, his preference for order and pragmatism, and his aversion to French political extremism. A slim, slicing analysis of some pivotal issues in the presidency of George Washington, who sought to finesse England and France and to deal simultaneously with political foes and two-faced friends at home. Irish scholar O'Brien (God Land: Reflections on Religion and Nationalism, 2001, etc.) died in 2008, but he left this coda to his 1996 biography of Thomas Jefferson, The Long Affair. Here he shifts focus to Washington, who recognized early on some key and apparently intractable challenges facing his administration and his new country: (1) restore trade relations with England; (2) distance the United States from the excesses of the French Revolution; (3) establish neutrality as England and France puffed chests at each other and stepped ever closer to ruinous war. Washington's agenda alienated portions of the population, many officials in Washington, D.C., and the opposition press. The most contentious of the newspapers, as O'Brien shows, was Philip Freneau's National Gazette, which blasted Washington with glee (and with little regard for facts) and which was also receiving surreptitious support from a surprising source, Washington's Secretary of State, Thomas Jefferson. O'Brien depicts a slippery Jefferson, who, with his principal ally, James Madison, engaged in an ultimately losing effort to swing public and foreign policy away from Washington and his ally, Alexander Hamilton. The author offers fresh interpretations of the Whiskey Rebellion - connecting it to the Jay Treaty, which re-established trade with England - and of the tenure of French representative Edmond-Charles Genet, who underestimated Washington, thereby disappointing his revolutionary patrons in France, who invited him back for a visit to the National Razor. A compassionate Washington instead allowed him to remain in the United States for the rest of his life. O'Brien also assesses Washington's sly move of sending James Monroe to France, appeasing American supporters of the French Revolution.